We all knew that the Food Security Card (FSC) or Ration card and its importance in day-to-day life. It can be used to procure government providing documents such as Driving License, PAN Card etc. Like each and every state, Telangana State Government is also providing the FSC to its citizens. Every day so many people are applying for new Food Security Cards (FSCs) either online or offline. After submission of application, every applicant will be waiting so patiently to get their Food Security Card (FSC). But the Government provided its applicants to search for their Food Security Card (FSC) with the help of their Aadhaar numbers. But for that, they should have registered or linked their Aadhaar number with their FSC. So that it can be easier for the FSC holder to search for his FSC. Citizens from all states can be able to check their Status of FSC Details online through their respective Government websites. Each and every state provides the FSC Search in their official websites. In here, we are going to discuss how to search FSC with the Aadhaar number. At first, Visit your respective State Government’s PDS portal. For example, for Telangana State click on the https://epds.telangana.gov.in/. On the homepage, click on the “FSC Search” on the menu bar. You will be redirected to a page where you have to select either “FSC Search” or “FSC Application Search” from the drop-down list. 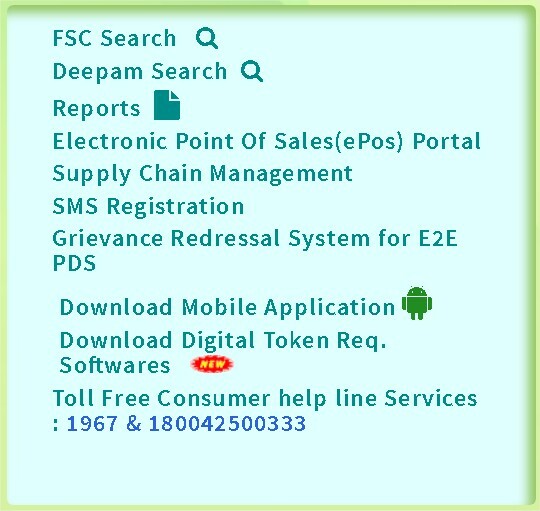 Click on the “FSC Search” to proceed further in searching for FSC using Aadhaar number. On the following page, Select your district name, FSC Reference number etc. You can search your Application Details using Ration card Number or old Ration card number. After entering all the details, make sure they are correct and click on the “Search” button. You details entered in their blank columns are verified and your results are shown are in the same page itself. The Application Reference number or FEC Ref is given to the applicant who applied for Ration card. They can use their reference number to track the status of your application. The following are the details which are displayed on the same page in the form of a table once you conduct a search for FSC with the Aadhaar number. Also along with all of these details, the candidate will also get the details of the family member if they are mentioned in the application form. If any interested in applying for Ration card then the head of the family has to apply for it. Once they have applied for the new new Card he will be issued a new one as soon as possible. Collect an application form either from a Ration shop or from an online portal. Fill up the whole application form with the head member of the family. Attach the photocopies of the Proof documents of all the members to the Form. Submit the application form either online or in the Ration office. After submitting the Application form you will be given an acknowledgement slip which contains a reference number. This can be also called as FSC Reference number which is used to check the Status of your FSC Application. If any of those details entered are wrong then you can even wait for your Ration card to be delivered and then apply for Data Modification online, or you can simply visit the Ration card office and can get access to edit, add and delete the data on your Food Security card (FSC). Try to apply for the FSC card on your own rather than depending on third-party agents who will do the service for a charge which can be done for free within a few minutes.